This is a compact one-day lesson that focuses on building vocabulary and on understanding metaphor. 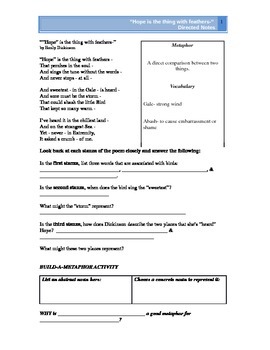 It includes the text of the poem, front loaded vocabulary, Guided Notes style questions and a creative activity for a closer. I teach this lesson to Standard English I students, but I think it is adaptable to many other levels. Included: The copy of the student handout along with Teacher Notes detailing how I use the lesson in my classroom.